Metaphorically speaking, an organization is like a car, with leadership acting as the steering wheel, the marketing department as the body-and-paint job. Culture, therefore, is the car’s engine. It is what powers the car forward. While combustion engines vary slightly from car to car, each one requires the same foundational elements of fuel, air, pressure and electricity to harmoniously work together to power the vehicle. Similarly, while thriving cultures undoubtedly vary across organizations, they all carry three foundational components that propel them. Powerful and effective cultures are those that are values-led, aligned and trusting. 1. Values-led: Values are what guide each and every one of us. Our values are also directly responsible for our beliefs. Our belief system then influences our attitudes. Our attitudes, in turn, affect our behaviors. 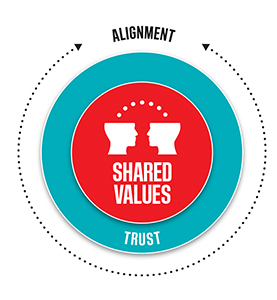 A culture that shares similar values will perform and collaborate better to one that doesn’t. 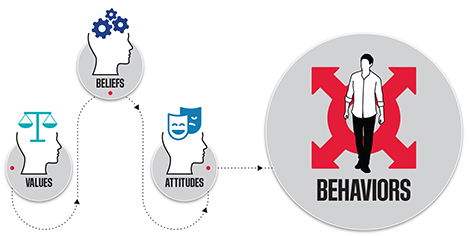 If the fundamental values between individuals on a team and the company as a whole differ, their subsequent behaviors will often contradict one another. At the nucleus of any high-performing group—be it a sports team, a neighborhood, or even a country—is an agreed upon set of shared values that each member holds, guiding his or her actions. 2. Aligned: An aligned culture is one that is pointed toward the company’s North Star. Not only does everyone share the aforementioned values, but they also understand and align with the company’s purpose and mission. They are aware of how the company impacts the world and appreciate how they, as an employee, play a role in achieving the company’s vision. This alignment instills a deep and powerful drive to push the company forward, promoting intrapreneurship and organically producing employee brand ambassadors. This also gives members a sense of belonging—something humans innately crave. Before modifying a car’s engine to make it faster and stronger, you need to ensure that bolts and wires are in place to connect the new pieces. Therefore, before an organization can look to strengthen or engage its culture, the key fundamental traits above need to be ingrained. This is the research and discovery stage. It is aimed at getting the heartbeat of the culture. Gather as many insights as possible to gauge the current state. Ensure whatever devices and tactics used during this stage are within means and repeatable. Investigate the overall sentiment of the culture at all levels of the organization via focus groups, surveys, open-door policies, interviews, management retreats, etc. Equipped with the research and insights from the previous stage, now it is time to diagnose the culture and define goals. What are the positive aspects of the culture that shone through in the research? What areas can be improved? Are certain desired attributes not as prominent as others? Create a few SMART goals for the top areas where you want to strengthen the culture. As explained earlier, the roots supporting a strong culture are the agreed and acted upon shared values. 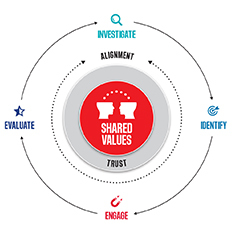 And remembering that values drive behavior, the opportunities for strengthening and engaging a culture can be addressed through three general avenues: Value promotion, value permeation, and value performance. Value promotion: Are the company’s values known by employees? Do they know why those are the specific values? Are they aware of how the values are guiding the company toward its vision? And are they being shown how the values are being acted on? Promote the company’s values in everything, from putting them on the walls in offices and manufacturing plants to including them in employees’ checks and performance reviews. Similarly, when communicating changes to the business, its strategy, or desired outcomes, clearly show how the initiatives relate back to the core set of values. Values permeation: How ingrained are the values? The organization’s values need to be embedded within everything, with the aim to have employees gain a deeper understanding of them. This can take form in numerous engagement outlets, from leadership development, to onboarding, to general education. Caterpillar creates a robust report highlighting their “Values in Action,” Salesforce has new hires volunteer on day one, the NFL sponsors its athletes’ chosen charities highlighted on their shoes, WeWork doesn’t allow its employees to expense meals with meat, SurveyMonkey has an internal recognition program—whatever the tactic or initiative employed for permeating the organization’s values into the culture, ensure that it is authentic and clearly understood by all members. Additionally, permeation is not preaching. For example, if a value of an organization is related to the environment, telling members to recycle more or to eat less meat is not diffusing the value. Instead, a more effective approach would be educating and informing them about why it’s important to value the environment and how it affects them by personalizing it. Thus, the simple act of recycling becomes one of the many possible outcomes caused by a value-driven behavior. Value performance: Are the values being lived? The goal is for the organization, leadership, and all members to continuously demonstrate and act on of the shared values guiding how they behave toward one another, their work, their clients, and their community/environment. To foster and encourage this, highlight and celebrate those individuals, groups, and departments within the organization that are living the values and who are demonstrating the related behavior. Now it’s time to measure. How’d you do? What went well? What didn’t? This stage is measuring both the results, as well as the effectiveness of the engagement tactics. What tactics worked? Which didn’t? As you continue through multiple progressions, you will begin to refine engagement practices, homing in on ones that are most effective for your specific business and operations. While it is not an official step of the cycle, the last step is: repeat. Strengthening a culture is not a one-off project, it is truly never-ending. As the company grows, so does the culture. This is why we call it a cycle—there is no endpoint, only further progress. Comments on "A 4-Step Cycle for Strengthening Your Company Culture"